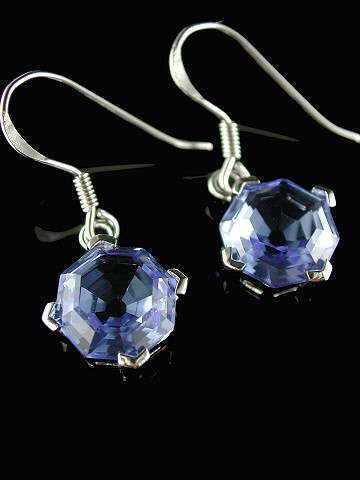 Oh so lovely - we adore Siberian Blue Quartz! The purity of colour is second to none and these emerald-cut 'Bagua'* shape earrings sparkle beautifully in the light. Set in rhodium plated 925 sterling silver. *A Bagua is an eight-sided shape (the roots go back to an ancient Chinese philosophy) and each of the eight sides is governed by an area; Heaven, Earth, Water, Fire, Lake, Mountain, Wind and Thunder. This shape will be well know to those who are familiar with the concept of the I Ching or Feng Shui. We have two identical pairs of these earrings available.